While Turkey and Israel talk of military cooperation the government of Ankara did not hesitate to reject the appointment of Ehud Toledano as Israel's new ambassador designating him persona non grata for remarks he made 13 years ago regarding the alleged Turkish massacre of Armenians during World War I. The Turkish government suggested Israel appoint an ambassador who 'will not arouse the Turkish people's opposition, and who will not become the victim of Turkish media'. In the same way, the recent appointment of Dan Kurtzer as Washington's ambassador to Cairo can only spur the Egyptian's people's disapprobation while invariably exciting Egypt's media. The fact that Kurtzer is Jewish doesn't matter. There were and still are several secular foreign ambassadors with Jewish ancestry accredited to Egypt. Like their Moslem or Christian counterparts they are welcome in the land where Jews were present for millenniums, at varying times occupying senior posts in the country: senators, ministers and MPs. But when it comes to the handpicked representative of the President of the United States, who and what he personally represents is of paramount importance. In certain Washington circles Kurtzer is described as a 'warm' Jew, meaning the connection between Israel and Judaism is often blurred whereby Israel is more often than not regarded as an ethnic or religious homeland. There is this that lingering emotional allegiance to the Jewish State, which is apt to resurface in times of crisis. It could therefore be argued that that under the circumstances a Jew, and a warm Jew at that, is not the right choice because of what might be called a conflict of emotional interest. The strong identification among America's warm Jews with the Jewish state derives from a deep sensation of a common Jewish fate, not to mention Shoah (Holocaust) memories passed down from one generation to the other. As a result, many of Kurtzer's highly placed Jewish colleagues took part in the singular Overseas Volunteer Unit, which allows American Jews to serve in the Israeli army. Equally important there are the strong ties with organized North American Jewry, the pro-Israel lobby AIPAC being one of them. Recently in Israel, Canada's former ambassador to Tel Aviv, Norman Spector, returned there to take up the post of publisher of the right of center Jerusalem Post, often siding with his ethnic homeland against Canada whenever dicey bilateral issues arose. 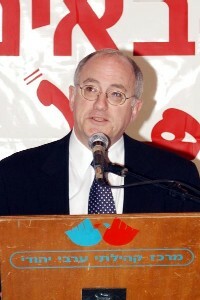 There is no doubt that veteran diplomat Dan Kurtzer is an authority on the Middle East. He not only holds a Ph.D. on the subject, but also was directly involved with the Peace Process during the past nine years. Moreover, he will have privileged access to the principals back home, many of them coreligionists, which in a sense means cutting out Foggies (Foggy Bottom Arabists) and other US State Department officers. Only two decades ago some of them reportedly told Kurtzer "You have all the qualifications to serve in the Middle East division, but don't even think of suggesting it." But Kurtzer is also a religious conservatist who sticks to kosher meals and observes the Sabbath. There is nothing wrong with that yet one cannot deny that religious and sectarian sentiments are high everywhere from Belfast to Sri Lanka not forgetting Israel where Orthodox Jews resent the presence of their reform counterparts and refuse them access to certain shrines and locales. "One doesn't need much imagination to fathom the effects of appointing a Catholic mayor, even if he is a secular Catholic, in a Protestant district of Belfast" exclaimed a former Egyptian ambassador peeved at what he termed as America's 'insensitive' decision. "It may make it difficult. There are going to be problems of perception especially within the media." While ambassadors are supposed to soften edges, bridge differences, soothe egos and press flesh they must also be perceived impartial to sectarian frays and internal politics. The risk here is that people, perceptions being what they will, draw conclusions even though they are totally unrelated. Kurtzer will invariably be perceived as a member of the Jewish nation, prejudiced to certain anti-Arab interests. Interests that coincide with those of the Jewish state of Israel which, when created in 1948 produced a regional sectarian divide, and launched several military invasions against Egypt. An Israel that continues to occupy and colonize Muslim-Arab territories to this day. "Whatever he does and however politically correct he behaves, for as long as the Arab-Israeli conflict remains unresolved, the new American ambassador will be perceived as wearing two hats, one of them being a skullcap or yarmulke" commented a professor of Political Science at the American University in Cairo. Rightly or wrongly, this grim discernment will usher in untenable situations with which Egypt can do without at this point in time. One cannot disregard the fact that a majority of the Egyptian population will see Kurtzer's appointment as a cynical American provocation. A provocation from an American administration that claims to be Egypt's ally. Except for al-Wafd, the usually feisty opposition papers here have been uncharacteristically moot about Kurtzer's recent appointment. So far, the semiofficial press has chosen to disregard the matter altogether. And since the sitting government is not expected to follow Turkey's example which rejected Toledano's appointment for a remark made 13 years ago, one hardly expects President Clinton's administration to reassess its decision and do what is right by Egypt: Look around for a representative of Uncle Sam who will be seen to be wearing only one hat.